From her Providence studio, Flowers by Semia, Semia Dunne has earned acclaim as a master of beautiful floral arrangements. It’s a reputation that has blossomed from a passion that took root as a teenager. “I grew up on a little plot of land where we did our own farming. I started a cut flower garden with my mother when I was 17 – and I got bit by the bug,” she explains. A part-time job at a flower shop while figuring out her post-graduate life sealed the deal, and Dunne hasn’t looked back since. In recent years, as the farm-to-table movement bloomed among food purveyors and consumers in Rhode Island, Dunne recognized that the same philosophy could be applied to flowers. 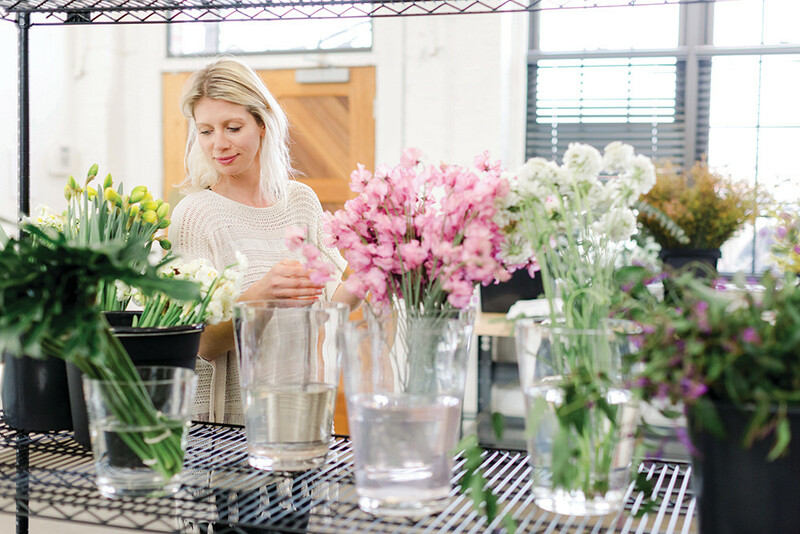 So late last year she launched The Floral Reserve, a wholesale shop next to the studio, where floral designers can browse a selection provided by local farmers – including many grown on her own farm in Lincoln – as well as imported Dutch flowers. During certain hours, The Floral Reserve opens its doors to the general public, giving everyone an opportunity to discover the bounty of area flower farmers. Which is good news for someone looking to add a little pop to their home or work space.